After hoisting teaser Macworld Expo banners of "something in the air," it seemed likely that the slogan would be an allusion to wireless networking. Instead, Steve Jobs exhaled the MacBook Air, a new ultra light laptop widely rumored in advance to be the star of the show. Echoing the drama of the iPhone presented last year in a glass capsule, Apple suspended a series of MacBook Air units on a cable stretching from the floor to the ceiling (below) at the show. Apple security first reprimanded anyone touching the models, but by the end of the day people were casually grabbing and commonly spinning the units. If handling the merchandise is any prediction of sales, the MacBook Air should blow off the shelves in gale force winds. The constant, enraptured pawing made it nearly impossible to capture any shots of the new laptops. Anticipating rumors commonly speculated about the release of a new slim laptop under the name MacBook mini, but despite its thinness and light weight, there's nothing really mini about the new MacBook Air. It has a full size keyboard that's nearly identical to the existing MacBook and the aluminum keyboards that debuted with the new iMac a few months ago. The Air also has a full size 13.3" display driven by the same Intel GMA X3100 graphics processor as the MacBook (both share 144 MB DDR2 SDRAM from main memory for the display), which supports external display resolutions up to 1920 x 1200, the native resolution of a 23" Cinema Display. It also supports analog VGA and TV output in composite and S-Video flavors. The new laptop also has a capable processor slightly slower than the current MacBooks (a Core Duo running at 1.6 or 1.8 GHz versus 2 or 2.2 GHz in the MacBooks, and 2.2 to 2.6 GHz processors available in the MacBook Pro), and 2GB of RAM built in as standard. Unlike the other MacBook models, there is no user serviceable upgrades or replacements for RAM, hard drive, battery, nor an ExpressCard expansion slot. Critics have already pounced on the design decisions of the MacBook Air, insisting that it needs various ports, a lid that allows users to swap out the battery, and future expansion slots for RAM and various other things. Critics need to say something of course, but the Air is clearly not intended to be a MacBook Pro killer, but rather a revival of the ultra portable Mac laptop. Apple pioneered development of ultra portable laptops back in 1992 with the Powerbook Duo, a lighter thinner laptop designed to sacrifice features on the road but pair with a dock that turned it into a more capable desktop system in the office. A stationary Duo Dock injected the Duo laptop like a cassette and provided it with additional RAM and VRAM, access to full size expansion slots, a math coprocessor, level 2 cache, a secondary hard drive, a floppy disk, and keyboard and mouse ports. The Duo was loved by a small segment of users who liked its portability and versatility, but the product line did not meet sales expectations. After the Duo was discontinued in 1997, the closest Apple came to delivering a lightweight road warrior laptop was the 2003 12" Aluminum PowerBook, which at 1.18" thick and 4.6 pounds was thinner and nearly as light as the 1.4" thick and 4.2 pound PowerBook Duo models. Unlike the Duos, the 12" PowerBook was a relatively speedy, full featured laptop with a good quality display and full array of ports. The 12" Powerbook was discontinued in mid 2006 with the release of the new 13" MacBooks. While slightly larger and heavier at 5.2 pounds, the slightly thinner 1.08" MacBook delivered better performance and general purpose appeal at a competitive price that helped to lead a resurgence of interest in Mac laptops. Apple's Mac sales have since followed an industry trend turning decidedly toward laptops. It's therefore no surprise that the newest Mac is another new laptop. 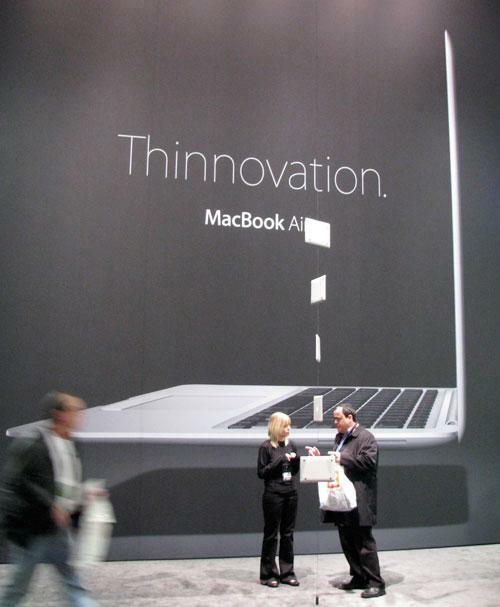 The obvious niche that made the star of Macworld 2008 easy to predict was an ultra light weight laptop designed to serve the needs of mobile professionals. While Apple was among the first companies to deliver light laptops back in the early 90s, it hasn't recently joined the bleeding edge of ultra portable laptops led by the Fujitsu Lifebook, Panasonic R5, Lenovo X series, and Sony VAIO G series. These machines and similar models vary greatly in the features, portability, and performance they offer, making direct comparisons somewhat difficult. Apple's new MacBook Air chooses to specialize in being very light and thin while also offering full size graphics performance. The result targets users who want a capable laptop with extreme portability, rather than an ultra tiny device, a budget priced laptop alternative, a more general purpose system with wide open versatility, or a small system that drops video output features and screen resolution to deliver a basic web browsing machine. In order to make the Air thinner than the MacBook and MacBook Pro, Apple had to streamline its features. Across the board, Apple turned the laptop from a computing machine into a slim appliance. There's simply no room for lots of ports, as this photo and video clip of the MacBook Air on top of a 15" MacBook Pro (below) indicate. The optical audio input and output jacks of the MacBook are gone and a simple stereo headphone jack takes their place. There's also no room for a full sized DVI port, so Apple included a new high density micro-DVI video output port that looks about the same size as a USB port. Using dongles, the device can output DVI for a modern monitor, VGA for analog monitors and video projectors, and even S-Video or composite video for use with a TV or simple projector. The third port on the MacBook Air is its single USB port. It lacks the convenience of multiple USB ports on each side as the other MacBooks, but this allows all of the Air's ports to hide behind a single flip down cover (below), leaving the rest of the unit with slim, aerodynamic edges. Users with needs for multiple USB devices will need to carry a USB hub. There are no other jacks: no Firewire, no Ethernet, and no ExpressCard expansion. That means the USB port will have to supply all the alternatives. Fortunately, there are plenty. Most external hard drives support USB, Sierra Wireless makes cellular mobile cards that work using USB, and Apple plans to offer a USB Ethernet adapter and USB modem. Also missing is an optical drive. It's possible to buy Apple's own slim, external USB SuperDrive for $99, but the new laptop also has a Bonjour-powered, wireless file sharing feature called Remote Disc that allows you to borrow the optical drive of any nearby networked Mac or PC. Doing so requires the installation of software that comes with the Air; it allows the Air to send a request to use the optical drive of a networked computer, and allows PCs to host Mac formatted HFS discs. There's nothing really magical going on with Remote Disk; it is essentially just setting up a file share that targets the optical drive and makes it Bonjour-easy to discover, select, and connect. Since most people only use their optical drive to install software or play DVDs, Remote Disc solves the first problem. To address the second problem, Apple recommends users ditch DVDs for iTunes movies. Remote Disc also supports NetBoot functions, so you can boot from a wirelessly shared CD or DVD. In addition, you can use the new Wireless Migration Assistant to bypass the missing Firewire port when importing your files and user settings from an existing computer. On page 2 of 2: Rich Features; A Sealed Ecosystem; RAM and Disks; and The Envelope, Please.